Cork’s Life Long Learning Festival, 2016 will run from Monday 11th – Sunday 17th April. Mayfield Arts will be involved in a number of events during the week. Mon April 11th, 12-2pm Mayfield Arts Centre. Mayfield Arts invites you to a joint exhibition of artwork created by two adult groups from the local community. ‘Memories of Mayfield’ is a project based around the memories, stories & recollections of locals. The creative outcomes from a series of conversations & workshops will go on display, including dry point etchings, textile art & poetry, along with photos & documented memories. Participants of the Tuesday Open Studio Art Group present their end of term exhibition, including drawing, painting, bookbinding & print. QQI (FETAC) awards will be presented to adult learners who successfully completed modules in arts based & horticultural courses in 2015. 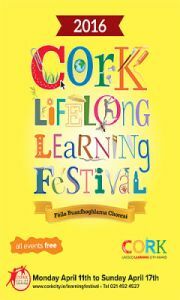 Tues April 12th, 12.45pm – 1.45pm, Mayfield Arts Centre. Ann Dalton is a writer and producer of children’s radio dramas, broadcast on RTE Junior. Her audio drama workshops are aimed at activating listening skills and igniting children’s imagination. The children first listen to one of Anne’s radio dramas; then explore how a story can begin and how it can be brought to life in a radio drama. The children have fun writing, illustrating and then recording short scenes. Pupils from Scoil Mhuire Banrion will attend this workshop at Mayfield Arts centre. Wed April 13th, 10am-1pm, Frank O’Connor Library, Mayfield. The Mayfield Community Eduction Network invites you to investigate, participate, and celebrate learning opportunities in the area with a morning of free workshops and displays from community groups and schools. Mayfield Arts will display artwork from Cúig studio artists as well as creative outcomes from a recent Creative Engagement project with young people from St Patrick’s Girls School. All welcome to come along and join in! free refreshments.